Twenty-foot equivalent unit « What Happened to the Portcullis? Port Technology reports that the IMO’s stricter sulphur emission standards are likely to have a profound impact on the maritime industry. With this in mind, PTI’s sixtieth edition pays a particular focus to the challenges ahead if LNG is to become the shipping fuel of the future and if this is the most viable option for shipping lines vying to meet these new regulations. Elsewhere, we have contributions form Drewry, Liftech consultants and a host of key industry experts, engineers and analysts. The Port of Durban is situated on the east coast of South Africa, in the KwaZulu- Natal Province. The port is the busiest on the African continent, and the biggest in terms of container capacity with 44 percent of South Africa’s break-bulk cargo and 61 percent of all containerised cargo flowing through it. In 2010 alone, the port handled 2.5 million TEU. The port has 57 berths and is protected by the north and south breakwaters, which are 335 metres and 700 metres long respectively. It was developed primarily for import cargo but over the years, cargo flows have changed significantly and exports have become more important. Over 4,000 commercial vessels now call at the port each year. 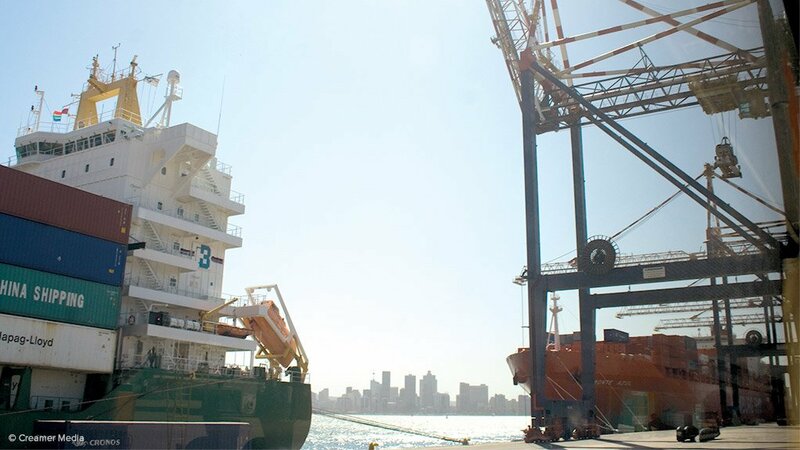 The Maydon Wharf multi-purpose terminal (MPT) handles a variety of containerised, break-bulk and bulk cargo, and specialises in the handling of specific commodities. The terminal also handles both import and export containers, taking it to an average of 15,000 TEU. It has an annual throughput of more than one million tonnes of break-bulk and neobulk commodities. The Maydon Wharf area consists of 15 berths and the MPT operates principally between berths eight and 13. The International Maritime Organization (IMO) is expected to make the weighing of sea containers mandatory. The purpose is to make the entire container supply chain safer. This regulation is expected to be issued through the International Convention for the Safety of Life at Sea (SOLAS Convention) as a result of a number of accidents involving container losses and container stack collapses. The existing SOLAS regulation already obliges shippers to declare the correct container weights, but this is not always done. The new regulation is likely to require specifically that the container is actually weighed or calculated by reference to the contents, packing and securing materials and the tare weight of the container itself. Importantly, however, the regulation is anticipated to forbid the loading of containers unless the verified gross mass is available to the terminal and the ship’s master. Practically speaking this means that the shipping lines may require terminals to verify container weights prior to being loaded onto their ships. There will, however, be a cost to it which the shipping lines are likely to pass on to their shippers. But besides added safety, there is another important aspect: optimising ship stowage which should reduce fuel consumption for the shipping lines. A ship is more stable at sea and consumes less fuel when the center of gravity is low and if the cargo is optimally distributed. Therefore, it is in the interest of the shipping lines to know the exact weights. Arguably, there are multiple aspects which determine fuel consumption of a ship, and some may be more important than stowage, but this is nevertheless a factor. First of all, to weigh a container and to use the load information to update the stowage plan, containers need to be weighed preferably at the completion of packing. Clearly, weighing export containers needs to be done sufficiently in advance for the stowage plan to be optimised. If the actual weight is not determined at the completion of packing, the port is in a prime position to provide this service or, indeed, to verify the documented weight. 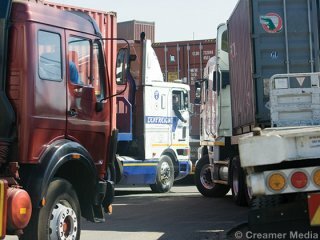 For containers that arrive at the port by road, rail or river an obvious ‘check point’ is during the inward process. Weighing with the quay side crane is too late, since the container position on the ship is determined well before loading. Weights of transshipped containers should be verified at the original port of loading, but there will always be situations where this has not been physically possible. In that event, it can be said with certainty that every container, whether exported or transshipped, will pass through the stacking yard. It is therefore argued that equipping the stacking cranes with weighing systems best caters for all circumstances. Operators in those countries that require imported containers to be weighed may consider weighing with quay side cranes as well. BILK (Budapest Intermodal Logistics Center) Kombiterminál has become the first Hungarian terminal to join the InlandLinks network, comprising of nearly 40 terminals across the Netherlands, Belgium, Germany, Poland, Italy and Hungary. 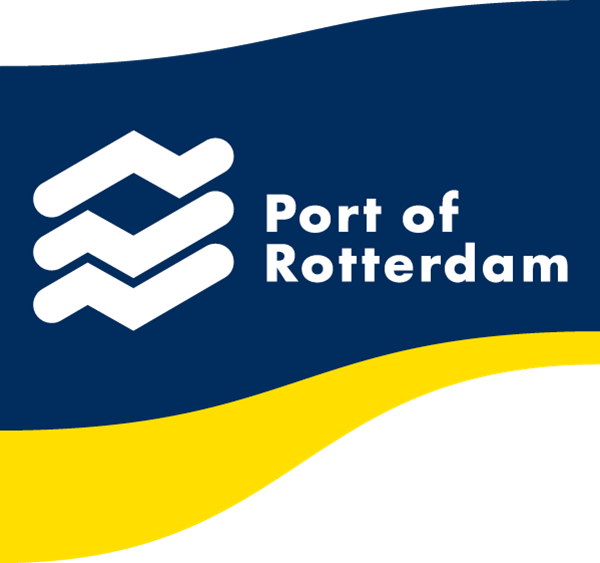 Rotterdam expects to see container flows triple over next 25 years in line with growth in world trade and the increasing size of container vessels. Of the 30 million TEU anticipated to be handled by the Dutch port in 2035, approximately 2 million are expected to be shipped in and out using smaller vessels from and to European ports. 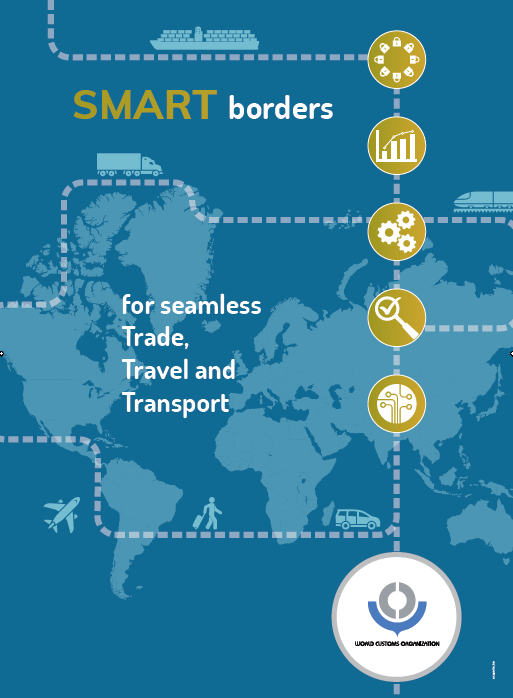 Some 18 million TEU will travel to and from the hinterland via intermodal transport, and the Port of Rotterdam hopes that InlandLinks will help to provide greater insight into better and more sustainable connections for this projected flow of cargo. Mega ships: positive asset or terminals’ worst nightmare? 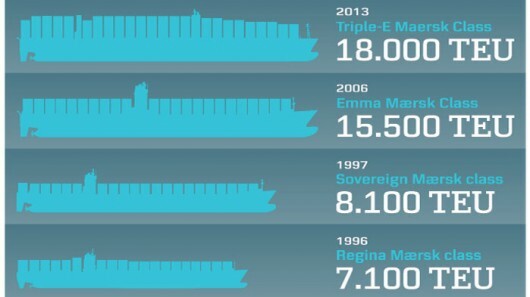 A Financial Times article reported Maersk’s Triple E Class (18,000 TEU) to be 26 percent more cost efficient than the current E class (15,000 TEU). – Wright, R (2011), Financial Times. 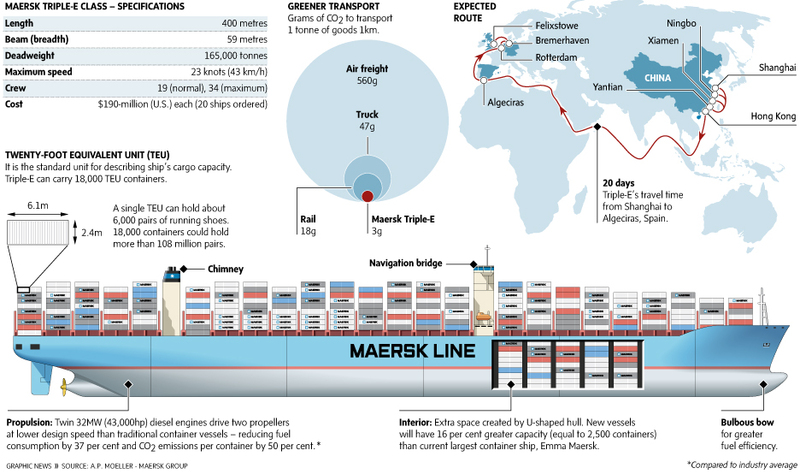 ‘Big Ships: Container lines reach for scale’. Recent research into supply chain costs indicates that this is not obvious for the entire supply chain – Streng, M. (2012). Slow steaming: an economic assessment of lowering sailing speeds on a supply chain level’, Master Thesis Urban, Port and Transport Economics, Erasmus University Rotterdam. The capital cost per TEU moved has increased even considering the increase in slot size of newer larger vessels. Due to the increase in transportation duration, the capital costs and insurance of goods transported have gone up. Further cost increase could be accounted for in the increase in time to market. Fast moving goods (such as consumer electronics) that need longer to get from the world’s production centres to the markets is also a cost. Shipping lines are demanding ever shorter port stays in order to make the economies of scale work. The bigger the ship, the greater the cost of hours lost in port, and an increased port stay is a diseconomy of scale. Port Technology have published the following article which should be useful for shippers, freight forwarders, port planners in better understanding the economics of international shipping and logistics – Mega ships: positive asset or terminals’ worst nightmare?. Is it a TEU or a FEU? Thinking outside the box – Tworty’s unit has doors at each end, the second opening to and locked from the inside. An innovative new ISO container design that allows a unit to be used either as a 40 ft or 20 ft box has completed its maiden voyage. 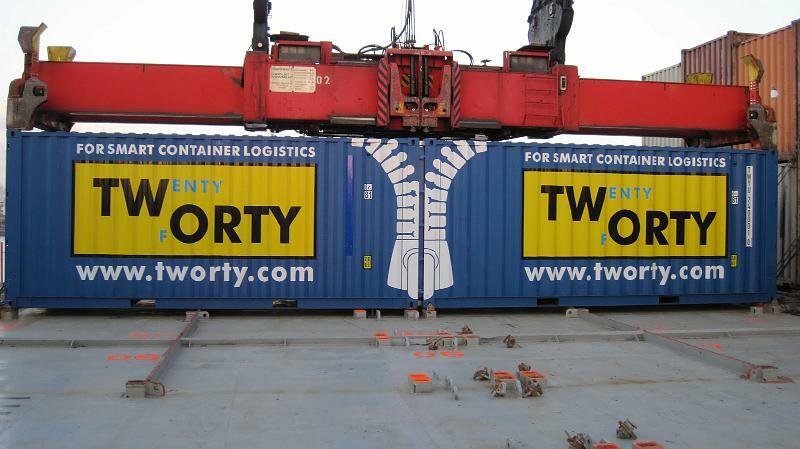 The Tworty Box, two 20 ft containers that can be linked together to form a single 40 ft unit – “twenty + forty = tworty” – competed its maiden voyage from Hamburg to Montreal on the containership OOCL Montreal. Two containers joined together as a single unit were stuffed with 20 tonnes of breakbulk cargo, mainly car parts and granulate, for Canadian consignees. Developer Tworty Box said the container was designed to reduce the cost of repositioning empties, caused by imbalances between supply and demand for 20 ft and 40 ft containers. As the company humourously explains on its website, 1 x tworty = 20ft, 2 x tworty = 40ft. It has doors at each end; the second door opens to the inside and can only be locked from the inside. This door can be fixed to the container ceiling and, with the use of its special bonding elements, another Tworty Box can be joined up, thereby creating a 40 ft unit of full value and standard doors at both ends. Tworty Box prototypes have received full International Convention for Safe Containers certification for single and for coupled operation. 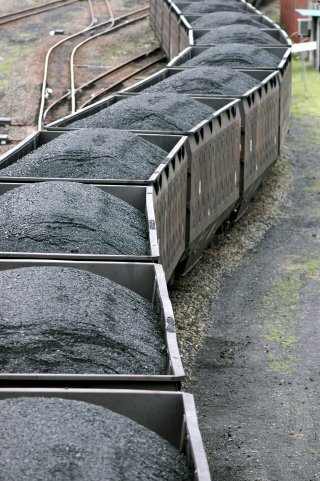 Source: Tworty.com and Lloyds. The world’s largest containership sailed on her maiden voyage with a first load of freight from Ningbo, China. The Marco Polo is at 16,000 TEU currently the biggest box carrier and is the first of a series of three similar dimension vessels that will all be named after great explorers. The delivery of the two next vessels is expected in 2013. This first voyage, w will be used partly to test the ship, the largest in service until Maersk’s 18,000teu Triple-E vessels start to be deployed next year. Owned by French liner group CMA CGM she will be operated on the company’s French Asia Line service’s FAL 1 rotation where all the group’s largest vessels operate on a fixed-day, weekly connection between Central and South China, the main exporting zones of the country, and Northern Europe. The direct service to Southampton and to Hamburg offers European importers the fastest transit times of the market. “It is with great pride that the CMA CGM Group launches this new vessel, which is the largest in the world. It shows the expertise of the Group’s teams, who are able to handle not only the very technical piloting of the ship but also its commercial operations. Our entire network of 400 agencies all around the world is active to ensure the successful launching of this ship. Singapore is relocating its transshipment port operations to Tuas in 10 years, a move that will add 65 million TEU in annual capacity, nearly doubling today’s capacity at local PSA terminals, announced Transport Minister Lui Tuck Yew. Consolidating transshipment operations at Tuas will bolster efficiency, economies of scale, eliminate inter-terminal transfers and result in cost savings and increased productivity. Located close to the island’s industrial centre, Tuas is a new port development that can handle up to 65 million TEU annually, nearly double Singapore’s present capacity at PSA terminals. The first phase of Tuas is scheduled to open in 10 years, ahead of the 2027 expiration of the leases of Singapore city terminals at Tanjong Pagar, Keppel, and Pulau Brani, noted Dredging Today. The recently completed Terminals 1 and 2 of Pasir Panjang will be merged in Tuas as well. But PSA Singapore will proceed with Phases 3 and 4, which will cover 250 hectares and add 15 new berths with a six kilometre quay. Container weight misdeclarations will compromise safety if new rules are accepted to allow 10 per cent more cargo aboard ships in the 4,000- to 16,000-TEU range, says the International Transport Workers’ Federation (ITF). The Lloyd’s Register liberalisation proposals to increase the stacking of boxes on board is backed by the forwarding lobby FIATA (Federation Internationale des Associations de Transitaires et Assimiles), but ITF port representative Albert Le Monnier says the measure is “absurd” without the verification of weights of laden containers before loading. “Look at the problem of misdeclaration we’re experiencing,” said Mr Le Monnier, former vice-president of Canada’s west coast section of the International Longshore and Warehouse Union (ILWU). “As a rule, self regulation has a very poor record.” The World Shipping Council (WSC), the Baltic and Maritime Council (BIMCO) and International Chamber of Shipping (ICS) as well as the US, Denmark and the Netherlands are seeking verification of weight of loaded containers as a pre-loading condition for ships. The practice needs to be shared or to be assigned to the shipper, consignor or consolidator through a system of roadside weigh bridges en route or have a weigh bridges at the terminal, said Mr Le Monnier, reported the London’s Loadstar. The cost to the terminal operator would be passed on to carriers, then on to the shipper, and ultimately end up in a negligible consumer end-price, said Mr Le Monnier. It is essential, he said, that any weighing verification of loaded containers isn’t rushed through without careful thought by the IMO “correspondence group” due to report back by June 2013, ahead of the deadline for deliberation in September on the issue. 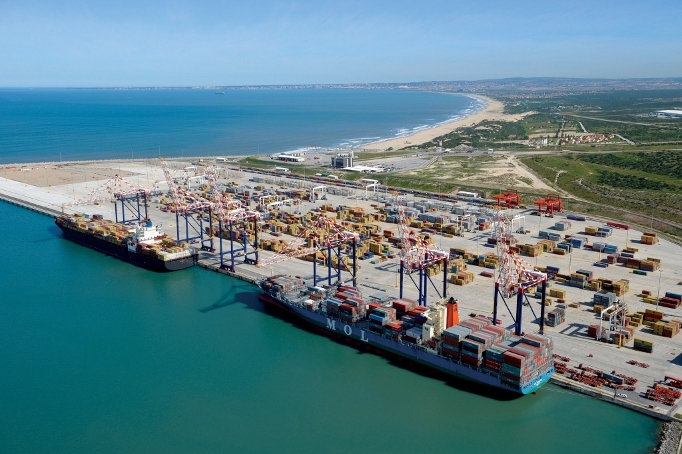 Transnet Port Terminals has successfully completed testing of two Liebherr Super Post Panamax cranes at Ngqura Container Terminal, just north of Port Elizabeth. The Ship-to-Shore cranes (STS), which were delivered in January bringing the terminal’s fleet of STS cranes to eight, represent an investment of R150 million by the port operator. The cranes will improve productivity by increasing Ship Working Hour (SWH) – the number of containers moved by the number of cranes working a vessel in one hour. A total of 78 additional operators have been trained and are ready to operate the equipment. 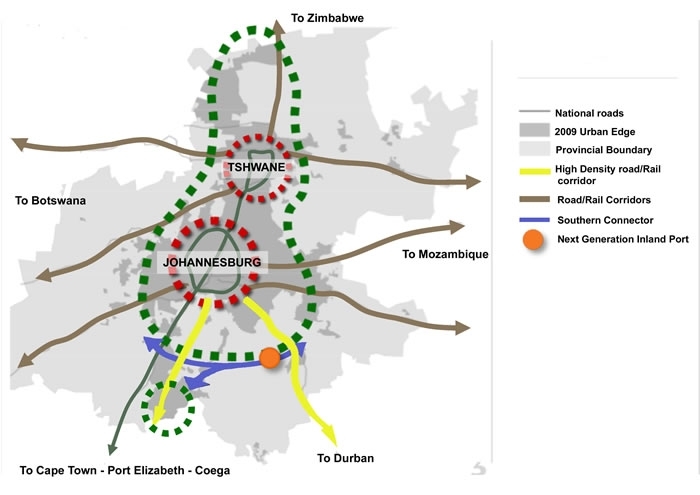 Transnet’s newly formulated Market Demand Strategy will see Transnet SOC Limited invest R300 billion on freight infrastructure over the next seven years. 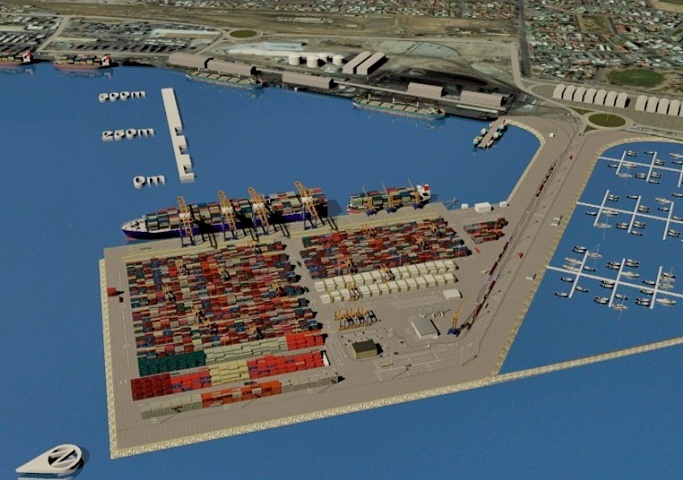 Of this, TPT will invest R33 billion to boost port operations.